Gotta kill 'em all! 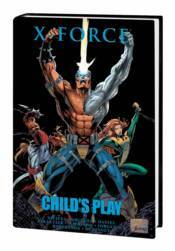 History, mystery, romance, family intrigue, a day in the life of a terrorist cell and more await in this union of two of the nineties' most powerful youth movements: X-Force and the New Warriors. The Upstarts' final game is on, and a generation of mutants is on the line! Guest-starring Magma, Karma, Bird-Brain and other New Mutant veterans! Featuring X-Factor and China Force! Collecting X-FORCE (1991) #32-37 and ANNUAL #3, and NEW WARRIORS (1990) #45-46.